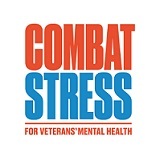 Combat Stress is the UK’s leading charity for veterans’ mental health. For almost a century the charity has helped former servicemen and women deal with issues like trauma, anxiety, depression and post-traumatic stress disorder. Follow Combat Stress on Facebook. Follow Combat Stress on Twitter.